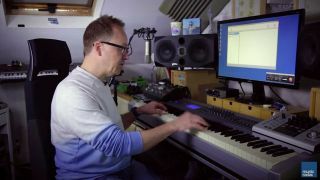 MusicRadar has teamed up with Steinberg and top Cubase expert and producer Bruce Aisher to put together the perfect introductory guide to setting up and using your computer-based home studio. If you've ever wanted to set yourself up as a music producer, discover the power of the modern affordable digital audio workstation and make your first track quickly and easily, then this is the series for you. All you need is a computer, some software (did you know that there's a 30-day trial version of Cubase Elements 8?) and the desire for greatness. Our Home studio start-up video series will take care of the rest. We'll be updating the site with further episodes covering everything from effects and VSTs through to pro-quality mixing and mastering every Friday over the coming weeks, so bookmark MusicRadar's Tech channel right now to stay in the loop! What is a DAW and what can it do? : In this first video we run through the basic elements of a DAW. Notes, tracks, mixer and more, and discover the vital parts that make up today's digital audio workstations. So you've got your computer and some software. Now what? : What makes up a home studio? Add controllers to play instruments, an audio interface to get sounds into your computer and out again, and speakers so you can hear your tune. We show you how to set up and get started. Time to start making some music: We record a simple beat using the controller. Then we add a bassline with MIDI notes. Then we record a vocal. And a guitar. Here's how to get started on your first tune. The nitty gritty: Let's flesh out the track and go a little deeper. It's time to start making the track a real production, rather than just a raw sketch. Video 5 - what is a VST? Introducing the virtual studio: What is a VST? What's the difference between an effects plug-in and an instrument plug-in? What's available and what's possible? Here's how to add a virtual instrument and apply some effects. Get it together: it's time to turn your track idea into a fully finished production. Chop, change, copy and paste your parts to build your tune. Learn about intros, outros, builds and breakdowns. Process to perfection: Discover reverbs, delays, ambient effects and more, and learn how and where to use your DAW's arsenal of effects ammo. Mix it up: How do you start a mix? Learn everything from balancing levels through to EQing and panning and get the various elements of your track all working together. Video 9 - what is mastering? Music mastery: Discover the art of mastering. Optimise your mix and create a final master version of your track so that it sounds great no matter where you play it. Sound advice: Discover ways to personalise your DAW with preferences, templates and shortcuts. Work faster and smarter and finish your tracks in record time.